The Mars City is the largest space simulation city ever built in the world and a realistic model to simulate living on the surface of the Mars. image used for illustrative purposes. An artist's concept of NASA's Mars Science Laboratory spacecraft approaching Mars. The Curiosity rover is safely tucked inside the spacecraft's aeroshell. 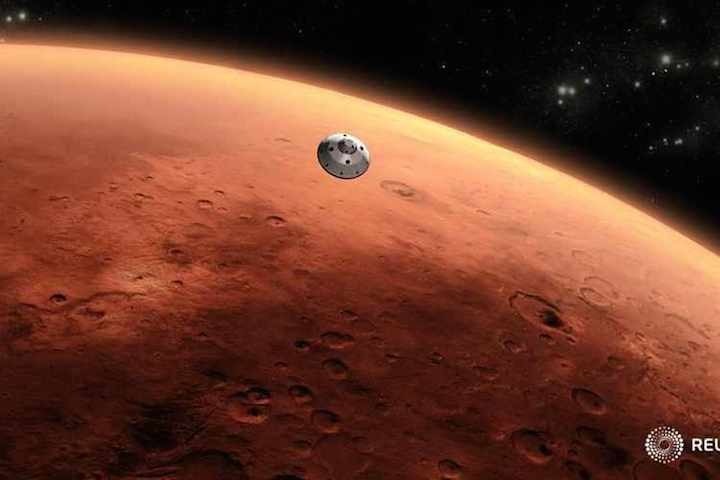 The UAE's Mars project, Hope, is on track and the work on the Dh500-million Mars City in Dubai will be completed in 30 months, said a senior official with the UAE Space Agency. Mohammed Nasser Al Ahbabi, director-general, UAE Space Agency, said budget and area have been allocated for the project and it will be completed in two-and-a-half years. The Mars City is the largest space simulation city ever built in the world and a realistic model to simulate living on the surface of the Mars. It will consist of several domes, with innovative construction techniques providing support for the structures. The project encompasses laboratories for food, energy and water, as well as agricultural testing and studies about food security in the future. It will also contain a Mars museum and a specialised science laboratory. Speaking to Khaleej Times on the sidelines of the Dubai Airshow, Al Ahbabi revealed that the UAE will start selection process of astronauts for the space flight from next year and priority will be given to Emiratis. The Hope probe is slated to be launched in 2020, but will reach Mars and begin to orbit it by 2021, to coincide with the UAE's 50th anniversary. "The UAE's space sector will contribute towards knowledge-based economy and also will position us as a leader in advanced technologies and industries," he said, adding that currently, three UAE universities are providing degrees in the field of space. With a total size of $6 billion (Dh22 billion), the UAE's space sector is the largest in the region in terms of investment, capabilities, maturity, knowledge and experience, he added. He said the UAE is drafting a space law that covers aims and objectives of national space exploration projects, including peaceful exploration of space and peaceful application of space technologies. It will also address advanced concepts that are emerging within the field, such as ownership of natural resources found in space.